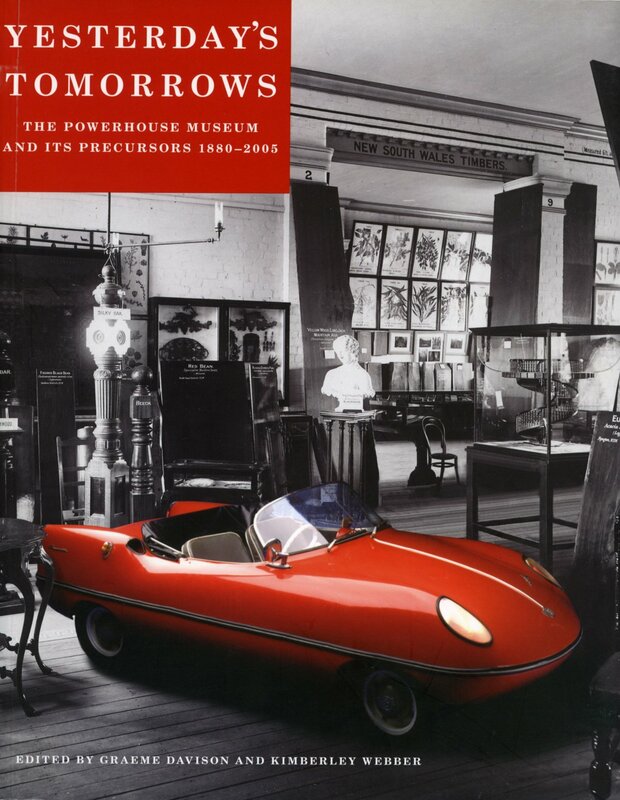 Tim Sherratt, ‘Remembering Lawrence Hargrave’, in Graeme Davison and Kimberley Webber (editors), Yesterday’s Tomorrows: The Powerhouse Museum and its precursors, 1880-2005, Powerhouse Museum in association with UNSW Press, Sydney 2005, pp. 174-185. 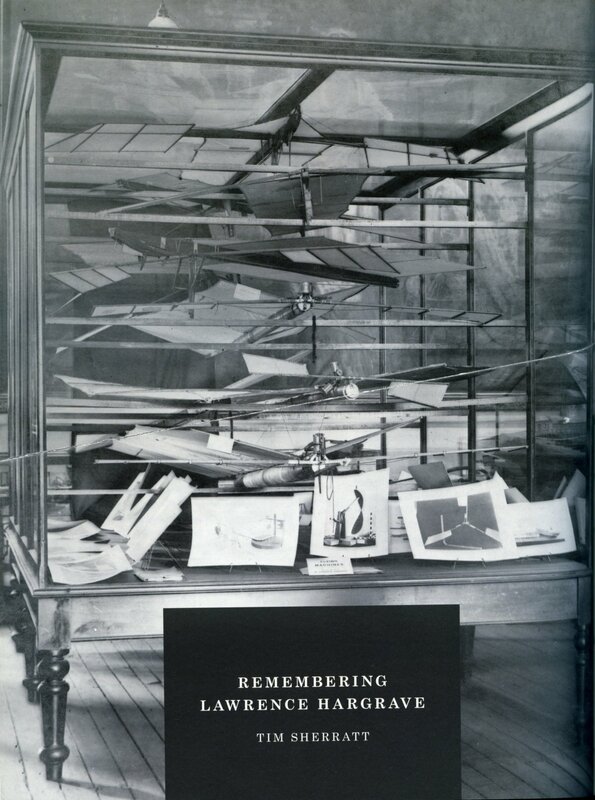 Remembering Lawrence Hargrave – Hargrave’s models on display, 1919. In 1962 William Hudson Shaw, a Qantas executive, knocked at the door of a cottage in the seaside village of Walmer, Kent. Shaw was in the grip of an obsession – a ‘labour of love’ to document the ‘true story’ of Australian aeronautical pioneer Lawrence Hargrave.1 This quest had brought Shaw to the home of Helen Gray, Hargrave’s eldest daughter, his beloved ‘Nellie’. Now into her 80s, Helen Gray remained firmly protective of her father’s memory, yet strangely ambivalent about his achievements. Nonetheless, through Hudson Shaw’s visit and the correspondence that followed, the two became friends and collaborators. ‘I feel so grateful that you have such great interest in L.H. [and] his work’, the elderly woman wrote in 1963, ‘what a difference it has made to my life that you appeared at the right time’.2 The biographer gained insight into the personal life of his subject, and the daughter was relieved of the burden of defending her father against the ill-formed judgments of history. With the return of the models to Sydney it seemed that Hargrave’s legacy had arrived home – a circle had been closed. ‘My thoughts turned back’, Helen Gray remarked, ‘to when L.H. first offered them to the T[echnological] M[useum] …very long ago’.6 The collected models and documents were finally arranged for public display in the Lawrence Hargrave Memorial Court, opened by the museum on 8 December 1967. Helen Gray did not live to see the completion of ‘Mr Willis’s new gallery’, but she was able to observe and enjoy the reawakening of public interest in her father’s achievements: in 1965, Lawrence Hargrave had been commemorated on a stamp, and the following year he joined Kingsford Smith as one of the faces on the new $20 note.7 ‘I am sure you will agree that this is the greatest compliment that has been paid to your Father to date’, Shaw wrote, ‘and if indeed you now need any endorsement of his place in Australian history his inclusion with such great historical figures as Macarthur, Farrer, Greenway, Lawson and Kingsford-Smith is endorsement enough’.8 Helen Gray died a few months later in April 1966. Her father’s memory at last seemed secure. In 1901, the needs of a growing family forced Lawrence Hargrave ‘to curtail the lavish expenditure of time and labour’ that he had, for more than 17 years, ‘freely given for the advancement of the art of flying’.10 In the hope that others would continue his work, he proposed to donate his collection of models and apparatus to the Technological Museum. Included were engines of various sorts, ‘soaring machines’ and models demonstrating ‘the mechanics of animal locomotion’. ‘Any other man who takes the matter up would be saved a huge amount of useless labour if he could see my results in their consecutive order’, he explained.11 He offered the collection on the condition that it be given ‘suitable well-lighted accommodation’ in ‘strong carefully made glass cases’.12 Richard Baker, the museum’s director, replied that his institution had no more money for show cases, and suggested instead that Hargrave might wish to update the existing display of his earlier models. It was a half-hearted effort that even managed to misspell the inventor’s name.13 Instead of seeking to maintain his goodwill, Hargrave’s resentment was allowed to fester. For the next eight years Hargrave searched for a home that would provide his creations with the care and attention they deserved. The University of Sydney baulked at the cost of cases; the University of Liverpool only wanted the ‘principal things’; the Aeronautical Society of Great Britain promised to keep his ‘generous offer in mind’; and while the Smithsonian was more enthusiastic, it could do nothing for two or three years until its new building was complete.14 ‘I once more lay myself open to be snubbed’, an exasperated Hargrave informed readers of the Daily Telegraph in September 1909. Offering the people of Sydney ‘no less than 13 tons measurement of models and apparatus’, he declared, ‘I cannot lay these models on the curbstone, neither can I build a hall to hold them’.15 As options dwindled, Hargrave repeated the offer to H W L Moedebeck, a respected German colleague. On the 13 January 1910 a cable arrived from Moedebeck: ‘Accepted’.16 Within a few weeks the models were on their way to the Deutsches Museum. ‘It is a regrettable thing’, noted the Sydney Morning Herald in 1915, and ‘indeed something of a disgrace’ that the government of NSW could find no room for Hargrave’s models.17 In the years following his death, the ‘indifference’ of museum authorities was taken as a sign of the ‘open ridicule’ with which the people of Sydney greeted Hargrave’s endeavours.18 He was treated as a ‘crackpot’, writers claimed, a ‘crazy kite flier’.19 When Hargrave had tried to donate his models to the museum, the Bulletin explained in 1940, he was ‘dismissed as a crank’.20 The fate of the models reflected Hargrave’s status as a neglected visionary. Hudson Shaw observed the tension between Hargrave the idealist, who foresaw an end to national conflict, and Hargrave the realist, who volunteered for battery duty and farewelled his only son, Geoffrey, to war.36 Hargrave understood the irony only too well. Responding in 1915 to criticism of a plan to use the German Concordia Club as a hospital for wounded soldiers, Hargrave insisted ‘it shows a mean and petty spirit if we refuse a figurative drop of water from the foe’.37 His letter to the Daily Telegraph is pasted in his journal. Next to it he wrote: ‘Geoffrey Lewis Hargrave killed in action on the morning of May 24th – about the time I was prompted to write this letter’.38 Geoffrey, who shared his father’s passion for engineering, was killed at Gallipoli. Other than a received letter and an index of expenditure, Hargrave’s journal ends at this point. He died of peritonitis six weeks later on 6 July. D M Dow, a publicity officer in the Prime Minister’s Department, was inspired. In December 1923, an article in the Argus lauded Lawrence Hargrave as the man who made the ‘air age’ possible.40 What particularly impressed Dow was the claim that, in August 1884, one of Hargrave’s monoplane models had become ‘the first inanimate thing to fly with its own power’. Dow wrote excitedly to the controller of civil aviation, suggesting that the 40th anniversary of this ‘great event’ be commemorated by an aerial display, in which Australian aviators would pay ‘homage to the memory of the Australian who made aviation possible’. In Hargrave’s home town of Sydney, he thought, fliers might ‘drop wreaths from the air over his grave’.41 Sadly, such a colourful, if risky, tableau was never to be enacted-Dow’s scheme failed to ignite official interest. But this was not the only attempt to have the inventor admitted to the pantheon of Australian greats. In 1915, obituary writers proclaimed Hargrave to be a ‘prophet without honour’, an ‘unappreciated genius’.42 For the past century, familiar reminders of his ‘forgotten’ status have introduced efforts to memorialise Hargrave’s achievements. The museum’s Lawrence Hargrave Memorial Court benefited from one of these earlier efforts, inheriting its commemorative function and more than £1200 from a fund established in 1920 by the NSW Section of the Australian Aero Club.43 Colonel Oswald Watt, a much-honoured aviator, argued that celebrations surrounding Ross Smith’s ‘epoch-making’ flight from England to Australia provided an opportune moment to recognise Hargrave, the ‘father of flying’. A suitable memorial would assist in ‘perpetuating the memory’ of this ‘pioneer of aviation’, who had persevered against ‘prejudice, disbelief and apathy’.44 Watt launched the fund with a donation of 50 guineas, but though a good number of worthy citizens followed his example, the proposed monument was never built.45 Watt drowned in 1921, and was duly honoured with his very own memorial.46 Ross Smith was killed the following year as he prepared for another airborne adventure. With so many dashing, young aviators risking their lives to push the limits of their art, the claims of the inventor, with his models and kites, might have seemed less pressing. The Lawrence Hargrave Memorial Court was closed in the early 1980s as the museum prepared its move to the Powerhouse. Most of the models were placed in storage, much to the annoyance of Hudson Shaw, who accused the museum of ‘hiding the collection and denying the public an opportunity to view a significant part of Australia’s heritage’.58 In 1994, as enthusiasts planned a re-enactment to commemorate the centenary of Hargrave’s famous kite ascent, the $20 note was replaced – the inventor’s familiar grey-bearded visage disappeared from public view. Once more it seemed the prophet was to be stripped of his honour, once more to be ‘forgotten’, neglected and unrecognised. According to a recent ABC television program, Hargrave has been ‘left out of the history books’.59 For over a hundred years, Hargrave has been commemorated most powerfully by admissions of ignorance and neglect. For someone to whom the idea of ‘recognition’ was problematic, it is perhaps appropriate that Lawrence Hargrave is most often remembered as a man too often forgotten. The models were Hargrave’s gift to competition, to the progress of civilisation. Whether they were in Munich, Washington or Sydney, as long as they were available to inquiring minds, they would spark further ideas and inventions. However, when the surviving models returned from Germany in 1960, they spoke not of the future but the past. Instead of inspiring young minds to ‘make things that fly’, the models were offered as a long-overdue memorial to ‘one of Australia’s great aeronautical pioneers’.73 This shift in meaning of course reflected dramatic developments in aeronautics itself – the days of timber and fabric were long gone. But the museum which welcomed them home had also changed. In 1891, Hargrave’s monoplane models were gratefully accepted by an institution with close ties to technical education. A decade later, Baker’s careless rejection came as he sought to develop the museum’s own research activities, while, in the 1960s, it was the collections that J L Willis was working to expand.74 The significance of the models varied according to the museum’s aims and emphases. In 1966, Hudson Shaw was worried that Hargrave’s original intentions were being ignored. The inventor was concerned, Shaw explained to Willis, ‘that the models should be … visible for all to see that they might learn how they were constructed and operated’. Damage and deterioration had made this impossible, he claimed, so that ‘even an Engineer might be surprised that they worked at all’.75 This was an ‘old argument in Museums’, Willis replied, whether to preserve or restore. In this case technical clarity was deemed less important than maintaining the models ‘exactly as when Hargrave last touched them’.76 The models were a record of the man, rather than a repository of ideas. The meaning of the models began to shift once again as they lay in storage in the late 1980s. The museum initiated a program to collect and document examples of Australian innovation – from the stump-jump plough to the Hills hoist and beyond.77 Successful innovators, according to the museum, were those able to protect their ideas, and to develop and market their product. Walter Hume, for example, Hargrave’s contemporary, used his idea for a new casting process for concrete pipes to create one of Australia’s largest manufacturing companies. By 1939 they held over 500 patents.78 Amidst this catalogue of Australian innovation, Hargrave seems an ill-fit – almost a case study of how not to succeed. He sought no patents, and was driven not by the needs of the market but his own standards of perfection and progress. In a world which seeks to harness innovation to economic growth, where ‘free-trade’ agreements reinforce protection of intellectual property, the lessons contained within the models remain difficult to discern. The Powerhouse Museum marked the centenary of powered flight, in December 2003, with the opening of a new exhibition- ‘Lawrence Hargrave: Australia’s pioneer aviator’.79 A hundred years earlier Hargrave had learnt of the Wright brothers’ success while suffering from a bout of typhoid (his health never fully recovered). But whatever doubts there might be about the nature of Hargrave’s achievements can be resolved by focusing on his place in the lineage of aviation. Whatever his frustrations or disappointments, there is no doubt that he hastened the development of manned flight. For all the ‘scorn and ridicule’, he was right. And to make certain of the point, biographers and enthusiasts continue their quest to prove a connection with the Wright brothers’ design. In the models we can see the foundations of flight, the evidence of Hargrave’s place in history. How should we remember Lawrence Hargrave? Is he waiting still, surrounded by his models, for us to grant him fulfilment? Does his life gain meaning only through our attempts to win him widespread recognition? Perhaps it shows more respect to leave him waiting and anxious – his passions still burning, his conflicts unresolved. Surrounded by his models, ‘his very soul’s work’, Hargrave is more than a link in the chain of progress. The models may no longer educate young engineers, but they do speak of determination and creativity. Knowledge without words – the museum holds the evidence of a remarkable man and his hopes. Dreams, too, can fly. I am very proud of my great great uncle.